I have been a Shelly Crane fan ever since reading, or should I say, devouring, her Significance series! I fell in love with both the story-line and great characters, and to this day, over a year later, I still find myself picking it up and revisiting Maggie and Caleb's story. This same pattern continued when I read Wide Awake last year, and I don't know why I'm surprised, but it happened again with Wide Open! Shelly Crane.....you're good you! One suggestion I'd make before diving into Milo's story, would be to read the novella Shelly Crane released in October entitled, Wide Spaces. This novella bridges the cap between Emma & Mason's story and Maya and Milo's story. Although there is tidbits of information in Wide Open that give you a brief idea of what happened in the novella, I think fans of the series would benefit from a more detailed look at the events that happen at that time of Mason and Milo's strained relationship......Plus, you get to see more Mason and Emma so it's a win,win! Wide Open is told in the alternating POV's of Maya and Milo. Maya is a tough little cookie that has been dealt some unlucky cards in life. Her whole family is gone, and all she has left is her dying brother. Milo's sudden appearance in her life scares her, and although she's desperate for Milo to chase her, she's not sure how or if she could handle losing someone else. Milo's character at the beginning of Wide Open compared to the character he is at the end of the novel are two completely different people. Milo carries around blame and hatred towards his brother and is trying to keep himself off the radar and hidden from some people in his past that are looking for him. He's got a lot of negativity built up inside and has a frailness to him that seems like he's ready to be pushed off the edge at any moment. Maya and Milo's relationship is very different from any of Shelly Crane's other couples. The fact that they are both recovering addicts and each both come with some heavy baggage, at first glance, makes you think a pairing between the two of them would be destructive. In actuality though, they bring a sort of healing quality into each other's lives. They're able to help one another because they understand the other's struggles and pain because they've each on their own gone through so much. The chemistry between the two of them is fire and seeing the transformation Maya's presence in Milo's life brings him gave this couple an unexpected sweetness quality to their intense relationship. 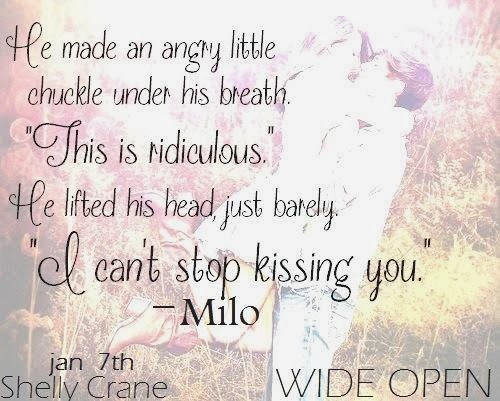 In addition to Maya and Milo's relationship, what made Wide Open such a great book for me was the fact that Mason and Emma are in this novel a lot more than I originally expected. We get to see where their relationship is, and how much they've grown since Wide Awake--it was completely heart warming to witness this couple from someone else's perspective as well. More importantly, getting closure between Mason and Milo's tense brother relationship, in addition to witnessing the dynamic between Maya and her brother Will, added another layer of love to this novel that made Wide Open the kind of book leaving you with LOTS of feelings despite it only being 259 pages. "I really love in when you call me sweetheart, Milo." "I love it when you call me Milo, sweetheart." Overall, Wide Open is a novel I highly recommend to those who've read Wide Awake (And if you haven't yet read Wide Awake, what are you doing?! Go pick it up ASAP)! Shelly Crane manages to capture the darkness of pain, loss and struggle and somehow weave into a beautiful romance that brings these two characters life again. Have you read Wide Open? What is your favourite Shelly Crane novel? Be sure to let me know in the comments below! Keep Reading! The one person that has ever made me feel alive is my cousin Briana. I have learned to live in the moment and to make each day count from her. Thank you for the amazing giveaway! That's so sweet :) That's such a special lesson she taught you-- something I'm trying to remind myself of everyday! It is just what I was looking http://awriter.org/affordablepapers-com-review for and quite thorough as well. Thanks for posting this, I saw a couple other similar posts but yours was the best so far. The ideas are strongly pointed out and clearly emphasized.